According to the calendar, summer ended yesterday, and September has closed that door and opened others. At the same time, a door is closing. Due to Microsoft’s corporate restructuring, on Thursday September 18, 2014, the company made several tough decisions (see “Microsoft to close Microsoft Research lab in Silicon Valley” among other news stories). 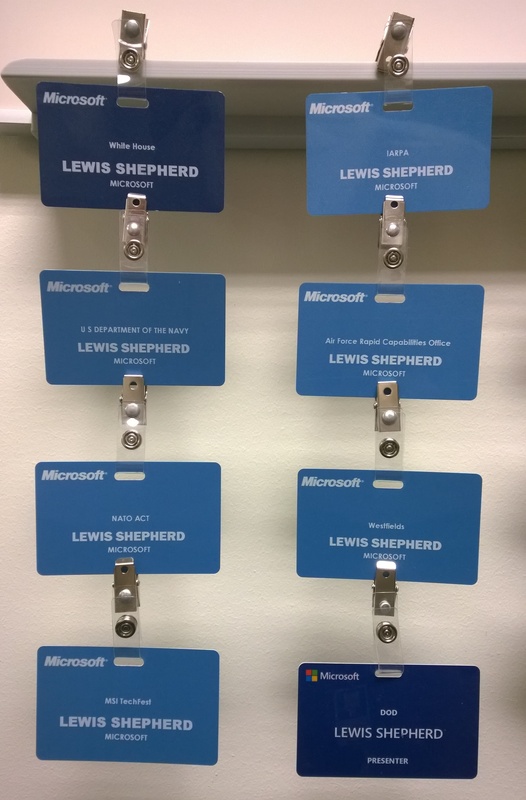 And that day marked the final day at the company for the merry band of brothers in the esteemed Microsoft Institute for Advanced Technology in Governments, which I have led since 2010. It was a pleasure to lead these extraordinary individuals and a privilege to work daily alongside the world’s most talented experts in their fields, guys like Dave Aucsmith, Bob Hayes, Bruce Harris, and Aris Pappas, who are each brilliant leaders and sterling friends. I’m still on the payroll at Microsoft, and may or may not stay in the company, but I can’t say enough good things about what we all accomplished since I joined the Institute nearly seven years ago to work alongside geniuses like George Spix. (By the way, that’s the longest I have ever spent in any one place in my entire fun-packed career.) When I joined the group as its first Chief Technology Officer (CTO) straight from DIA, I found it filled with like-minded innovators, eager to enable difficult government missions with cutting-edge research and technical solutions. Much of what we did remains, necessarily, shrouded in corporate proprietary information and the nature of the sensitive counsel we provided senior government executives. But also along the way we wrote innovative white papers, conducted seminars, and traveled the world working with Microsoft’s field teams and solutions architects to devise unbelievable capabilities, for local and national governments trying to serve and protect their citizens. Most of all, we had a blast working together. In the parlance of our day, I’m “updating my LinkedIn profile.” But I even consider that as fun, too – because of the serendipitous breadth I see there, for a kid who has gone from writing dusty political science papers on civil-military relations, serving as a Cold-War Pentagon Kremlinologist for Andy Marshall, doing policy and speeches for the mayors of San Francisco and San Jose, helping launch an artificial-intelligence data-mining startup (successful!) in Silicon Valley – to then helping the IC answer the attacks of 9/11 and fight the Global War on Terror. My time with Microsoft has been another incredible ride in a long, fun roadtrip … and I’m eager to turn the wheel around the next bend and floor it. I will always fondly remember the Microsoft Institute and your mentorship! Congratulations Lewis! Hopefully Microsoft is smart enough to find something to interest and challenge you – I think they are. It seems to be a season of changes, may they all be for the better. I look forward to seeing what you do next.